1969 Surf-o-plane Advanx Marlin model 3' 6"
Deck: Advanx - White, Round bonded, tail left. Deck: Blue with yellow images, Marlin, Boat and Sun. "A man of much mental as well as physical energy, Beaurepaire found a suitable sphere of business enterprise when, with a Canadian acquaintance, he formed the Advanx Tyre Repair Co. in Sydney in 1920. In 1922 he decided to return to Melbourne, and founded the Beaurepaire Tyre Service there, with his brother-in-law Oscar McKay as partner. The business prospered, thanks largely to Beaurepaire's skill in choosing staff with the necessary technical abilities, and his persuasive qualities as salesman and promoter." J. R. Poynter: Beaurepaire, Sir Francis Joseph Edmund (Frank) (1891 - 1956). Australian Dictionary of Biography, Volume 7, Melbourne University Press, 1979, pp 236-237. 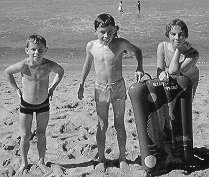 The design '' was soon in mass production, being hired by the half hour on Sydney beaches, and proving popular with all ages and both genders. Surf-o-planes were... filmed for Movietone News 6/7 (1935), ...Movietone News 7/15 (1936), ...Movietone News 8/13 (1937), ...Movietone News 9/14 (1938) , which included shots of Dr Smithers riding his invention at Bronte, ...and...Movietone News 10/6 (1939) " - Thoms : Surfmovies page 40. The craft was extremely popular, Manly Surf Life Saving Club reported 261 rescues for the 1938-9 season, half of which were carried out on or swept off rubber floats. ( Bloomfield, pages 54 to 57). Surf-o-plane riding was included in 1938 Australian Surf Titles (only time, won by Jack 'Strawb' Turnbull) and in the Makaha contest for a period in the 1930's. 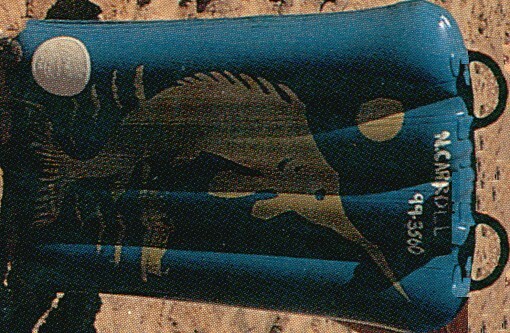 In the 1940's, Olympic swimmer and industrialist Sir Frank Beaurepaire's rubber company manufactured a Surf-o-plane/Rubber Air Mat using the Advanx brand. There were eventually three models - Elite (5ft), Standard (4ft) and Small (3ft). Colours other than black were also available - yellow and black with yellow stripes. Sold to the public from the factory at Neild Avenue, Rushcutters Bay Sydney for 8 pounds ($16.00), the company also offered a repair service and compressed air fill ups. By the 1960 the design was available from several companies, notably Clarke Rubber and Advanx, and with the expanded use of the automobile sales were directed more at the general public than the hire concessions. This was principally done by elaborate decor, for example the Advanx Marlin model as surfed by Nick Carroll in 1969, while some later models had twin fins. The contribution of this design to moderm surfing is immense. 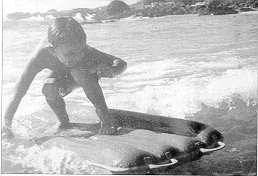 In Australia it was used extensively by all types of beach-goers and was the basis for juvinile surfers to gain surf experience before advancing to surfboards - for example, four times world champion, Mark Richards ( Knox : M.R. pages 6 to 8, 14 and 16 - see below). The Surfoplane had similar impact around the world, photographic and text evidence suggests the craft was widely used in New Zealand, Hawaii, California, South Africa and England. Performance : The Surfoplane had high bouyancy, but were relatively heavy and stiff, unlike the craft that replaced them. This combination of features assisted both getting through the surf and wave riding. Examples : The nature of the rubber used in the Surfoplane meant that if it was not constantly inflated they would bond internally, and become useless. As a result, it appears few have survived to the present day. One blue/yellow example is held by the Penisular Surf Centre, Victoria. Thanks to Ted Bainbridge. Photograph plate facing page 86.Image below and manipulated colour image top. Damin Lovelock and Angela Katerns and public contrbutors, on ABC Regional Radio, 1999. Kirra Beach Queensland, circa 1960.